Andy Lopez, a hispanic 13-year-old from Santa Rosa, was shot and killed by a Sonoma County sheriff back in 2013, and in December, the Sonoma County Board of Supervisors voted 5-0 in favor of approving a settlement requiring Sonoma County to pay $3 million to settle the civil rights lawsuit filed by Lopez’s family. This settlement concludes one of the county’s most distinguished civil rights cases. According to county statistics, this settlement is the most amount of money Sonoma County has paid out in cases involving officer use of force. On Oct. 22, 2013, Lopez was walking down the street carrying an airsoft gun, which closely resembled a rifle, when he was shot by then-deputy Erick Gelhaus. The orange tip of the airsoft gun, required by law, was missing, which would have indicated to the officer that the gun was fake. 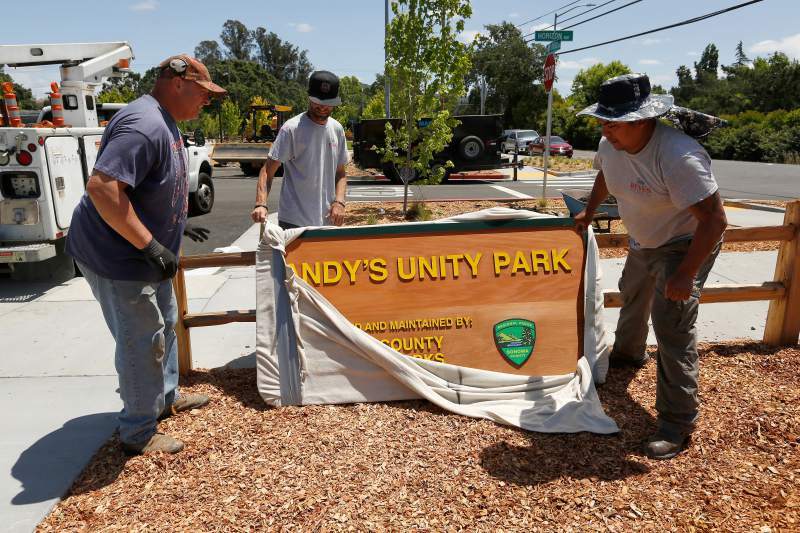 Dave Bailey, left, of Healdsburg Signs, with Thomas Rogers and Miguel Reyes of Reyes Sign Erection unwrap the official Sonoma County Parks sign for Andy’s Unity Park in Santa Rosa on May 31, 2018. Gelhaus parked about 35 feet behind Lopez as Michael Schemmel, the other sheriff deputy in the car, turned the police sirens on. Gelhaus jumped out of the car and shouted to Lopez to drop the gun as Lopez, whose back was facing the officer, began to turn, simultaneously raising the barrel of his airsoft gun. The deputy opened fire, shooting eight times and hitting Lopez with seven of them. He was pronounced dead at the scene. The officer told the investigators he was left with no other choice than to open fire due to the fact Lopez was raising the airsoft gun and there was no orange tip to indicate it was not a lethal weapon. The lawsuit was filed by the Lopez family roughly two weeks after the incident, in November 2013. The federal lawsuit claimed Gelhaus acted carelessly when he shot at Lopez and also stated that the Sonoma County Sheriff’s Department was initiating policies which encouraged and condoned the sheriff’s use of deadly force. Jennifer Larocque, a Sonoma County spokeswoman, stated the case in itself has been estimated to have costed approximately $1.4 million in legal fees over the past five years. In honor of Lopez’s life, the empty lot he was killed at has since been converted into a park. The space in Santa Rosa, known as “Andy’s Unity Park,” includes a skate park, playground, and landscaped gardens. This park commemorates the life of Andy Lopez and honors him through a space that came to be through a community’s determination and dedication to getting justice, with the hope of avoiding any similar circumstance from arising. Last month, though, a tragedy occured in Tempe, Arizona, bearing similarities to the Lopez case. Sandra Gonzalez and Juan Antonio Arce, the parents of Antonio Arce, sat in their home on Jan, 29 and had to speak about the death of their son, who was killed on Jan. 15. The 14-year-old teen was shot between the shoulder blades as he ran away from a Tempe police officer shortly after they observed Arce invading a truck. In the footage, the deputy orders Arce to show his hands and step outside of the truck, but instead, he attempts to escape down an alley. Arce was pronounced dead at the hospital. The Tempe Police Department state that he was running away with an airsoft gun which was taken from the vehicle. It is noted, however, that the airsoft gun did still have the orange tip attached to it, indicating that the weapon was not lethal. Similar to the Andy Lopez case, police officials claim the firing took place because the suspect was perceived as a threat. Ultimately, the family wants the Tempe Police Department to be held accountable for what they did to their son. “Police have their jobs, but their job isn’t to kill innocent people,” Gonzales said.